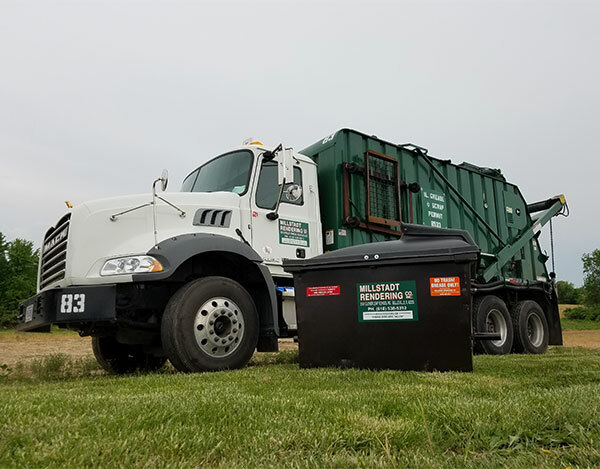 Used Restaurant Oil Recycling in St. Louis, MO | Millstadt Rendering Co.
Millstadt Rendering removes used fryer oil/grease from restaurants and food processing plants. This recycled oil will be used as a raw material in animal feed, fertilizers, bio-diesel and other products. What type of storage containers are available? Customers are provided with an outside storage container/dumpster based on the volume recycled. Below are the three size containers. Dumpsters need to be in an area with no overhead wires or tree limbs. Millstadt Rendering does not install inside grease containment systems but can pump the oil from an existing inside system. What oils are accepted for recycling? Millstadt Rendering recycles most vegetable oils including corn, soybean, canola, peanut etc. Animal fat such as lard can also be recycled. What should not be put in the grease recycling container? Motor oil, wash water, trap water, antifreeze, paint, paint thinner, rags, paper towels, plastic bags, glass, yard waste, grill bricks, straws, rubber gloves, food waste, chemicals, cleaning supplies, or anything else that is not fryer oil/grease. How often is each account serviced? Service frequency will be determined by volume, location, and area route cycle. Some accounts are serviced once a week, once a month, or once a year. Recycling volume may not be steady. Changing the fryer oil more often, adding/using additional fryers, and seasonal peaks in business due to festivals, events, & trade shows may challenge the service cycle. If the recycling volume increase or decreases, it may be necessary to change the service cycle. To avoid overfilling your container call the office if you experience any of these changes in your volume. What will cause my container to have an odor? When cleaning fryers, be sure that wash water is not put into the dumpster. This will likely create an odor problem. Pouring the wash water from the fryer down the drain, may result in a clogged drain. Place the wash water in a five gallon bucket. If there is any grease, it will float to the top and the water will settle on the bottom. Take a paper towel, skim off the grease, and throw the towel in the trash. The rest is water and can be safely poured down the drain. Is there a value to the fryer oil/grease? Restaurants are paid a rebate. Geographic, environmental, global, manufacturing, and financial markets are some of the factors that affect the amount of the rebate. Rebate values fluctuate with the market. Who will service my container? MRC does not subcontract–only a Millstadt Rendering employee/truck will service your account. For additional information or questions, please call the office. 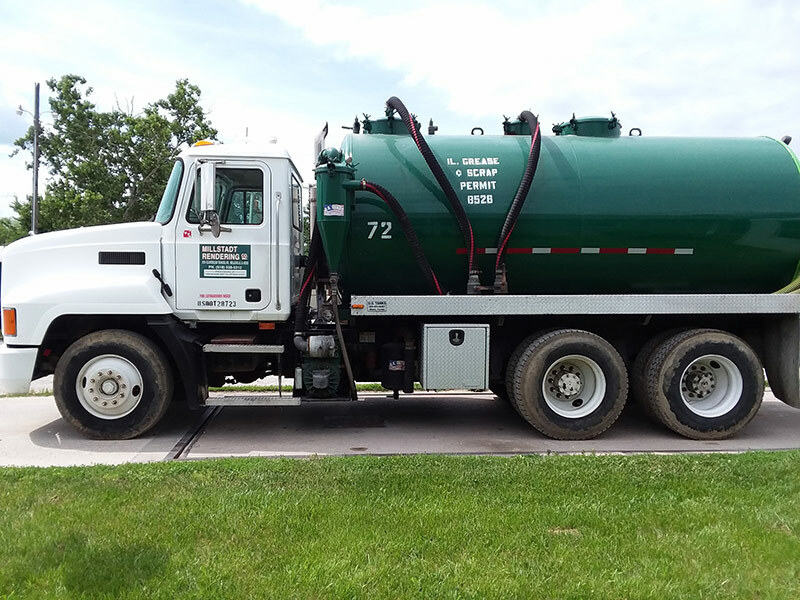 Millstadt Rendering cleans inside and outside grease traps in the St. Louis Metro area. Grease traps are designed to prevent any grease that is poured down the sink, floor drain, or discharged from the dishwasher from entering the sewer system. In the trap, grease floats to the top and solids settle to the bottom. Grease traps need to be vacuumed pumped periodically to remove the grease and solids. Many municipalities regulate how often a trap must be cleaned. Check your municipality for the codes and regulations on managing grease traps. The cost to clean a trap is based on the size of container and geographic location. Call for a price quote. Remove bones, fat, hide, meat trimmings, and scraps – which are picked up from many butcher shops and meat markets. 3151 Clover Leaf School Rd.